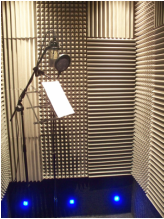 Your voicereel will usually contain a mixture of commercials, narrative, documentary and drama pieces. Before the recording session, we'll have a consultation. During this we'll go over a range of scripts together and find out what will suit your voice and your requirements. During the recording you'll be given as much help & direction as you need and the session will only finish when you are happy with everything. Our prices are fully inclusive of all the recording time you need and the mixing & production is undertaken afterwards, not in the time that you're paying for. Voicereels.co.uk is based in South West London between Tooting Broadway and Streatham Common. The studio is a few minutes walk from Streatham Common train station or ten minutes on the bus from Tooting Broadway underground. The company is run by Rob, who is an actor and stand up. Rob has been working with sound since the late nineties, from working with live bands and comedians, to radio, podcasting and editing soundtracks to live shows.